I love trees, especially the native fruit-bearing trees of Israel that are mentioned in the Torah - olives (photo above), grapes, figs, dates, and pomegranates. Our citrus and deciduous orchards here are magnificent too, and if you've ever tasted Israeli fruit, it's hard to eat anything else. My best personal prayer sessions and musical inspirations are out in the orchards. Trees are a metiphor to our existence. The deeper our roots, the stronger we are. I write about it this week on Breslev Israel web magazine, so check out Save the Trees. 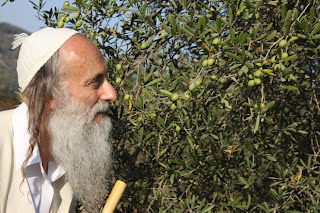 My esteemed and beloved teacher Rav Shalom Arush also speaks in tree imagery this week in First, the Peel. Tal Rotem is also in a Tu B'Shvat mood in Here to Stay, writing how no one can uproot us from our holy land as long as we cling to our roots. Rivka Levy talks about The Two Voices in your head. Racheli Reckles starightens people's thinking in The Look of Love. Chaya Ovadia is tested From Head to Toe. Dr. Zev Ballen gives a knockout to traditional psychological thinking in Depressed? So What! Yael Karni acquaints us with basic mystical concepts in Divine Illumination. This week's Torah portion is Beshalach. Don't miss Rav Dovid Charlop's elaboration in A Kiss From Above. Bright Beams Blessings for a beautiful week!